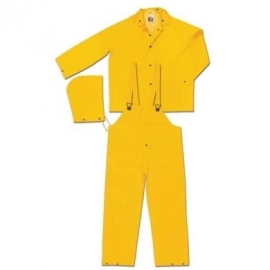 EXTRA LARGE - Yellow Heavy duty industrial quality rainwear. 35 mil - PVC/Polyester rain suits. 3 PIECE design with Detachable hood. Storm-fly with snap buttons. Yellow corduroy collar. Ventilated cape back. 2 Flapped paockets, pants with bib fly front and adjustable suspenders. Underarm vents. Protects from chemical splashes.